For those men who like a ring to be strong and masculine like themselves then our titanium 7mm satin finish knife edge wedding band is a perfect match. Crafted of grade 2 titanium which is 7 millimeters wide and has a top surface with satin finish on a knife edge design of center of the men's wedding ring. The spectacular ring was made using comfort fit design to ensure a lifetime of wearing comfort. Titanium is many times more durable and stronger than most precious metals such as silver or gold, which makes it ideal for crafting men's wedding rings. 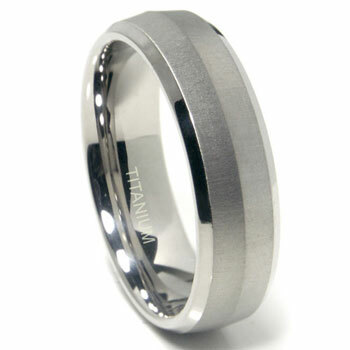 A titanium wedding ring is the perfect way to celebrate and remember life's special moments. Most men like to wear a titanium wedding band due to the fact it is stronger than most steel metals, yet is nearly 50% lighter. Be sure to shop our site for all your wedding ring and jewelry needs. I ordered this ring after my fiance picked it out as his wedding band. I had planned on getting it engraved so I was happy to hear that TitaniumKay sent it to us first to see and then we sent it back and they engraved it afterwards. Its a beautiful ring and looks very expensive, much more then its price! We were recommended to the site after a friend used it for his wedding band. I would totally come back for another order if we ever need it. Thank you so much!